In the trial of three Santa Clara County jail guards accused in the jailhouse murder of mentally ill inmate Michael Tyree, another inmate took the stand Tuesday and testified he was beaten by the trio on the same night. 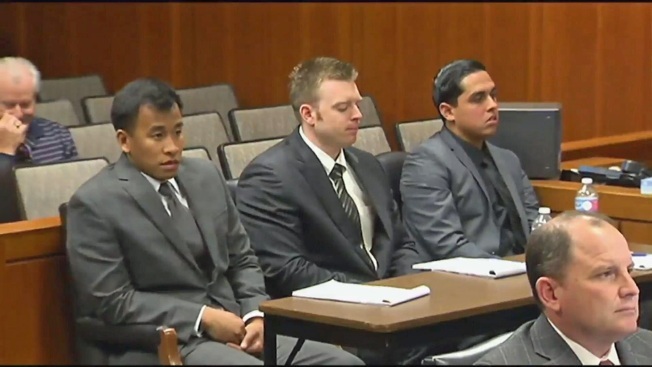 The sheriff's correctional deputies, Jereh Lubrin, Rafael Rodriguez and Matthew Farris, pleaded not guilty to second-degree murder charges in the August 2015 death of Tyree. In a San Jose courtroom Tuesday, inmate Juan Villa testified he was housed in the same wing as Tyree. Both were diagnosed with mental health issues. Villa reiterated what he said in an interview with NBC Bay Area: The accused guards beat him up before heading into Tyree's cell. Michael James Tyree pictured in 2012. "The three correctional officers repeatedly hit him in the head," said Paula Canny, Villa's attorney. "They twisted his arm and bent his arm behind his back." Villa's testimony follows that of two other inmates on Monday, both of whom said they heard Tyree screaming in his cell hours before he was found dead. The three deputies have been on paid leave since their arrests in September 2015.